Not the world’s smallest chess set, but very clever tiny chess set in a ring. 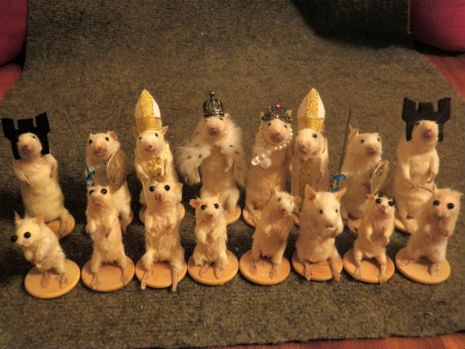 Every so often I run across links to this taxidermy mouse chess set available for $550 on Etsy. All specimens were acquired from a captive breeding facility that distributes frozen rodents for reptile feeding, so don’t feel sad if these little guys were not battling it out on the chess board they would be deep in the belly of a snake. A few years ago I recommended the Chess by Blog plugin for WordPress, which added a number of chess-related functions to WordPress blogs. So, of course, that particular plugin was abandoned a couple years later. It looks like RPS Chessboard is now the most versatile, actively developed WordPress plugin that will take chess games in PGN notation and create interactive chessboards in a WordPress post or page. 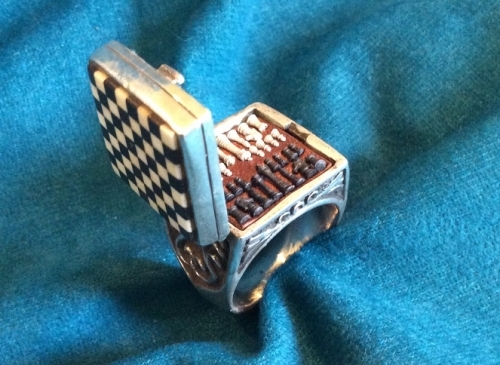 Earlier this month, police confiscated chess gear, tables and chairs at the site [on San Francisco’s Market Street]. Police Capt. Michael Redmond told the San Francisco Chronicle last month that he agreed the chess players themselves weren’t the problem. But others used the games as a shield for illegal activities. Redmond said arrests and complaints from merchants increased in the area. That’s cop logic for you: there are people selling drugs and engaging in gambling near people playing chess, so the obvious solution is to ban chess playing.